Oh, yes, it's here folks: Top Chefseason 5 is upon us. Last night's premiere was everything it should be: Only snippets of who the new 17 (er, 16) contestants are; Padma making sure everyone knows New York is a cut-throat town so this season will be, too; Tom being Tom, Gail being Gail; bonus Jean-Georges Vongerichten as guest judge. Just like last year we'll have these weekly recaps, hopefully some interviews and general TC obsessiveness, all skewed toward our local contenders (as long as they last)---Stefan Richter, Alex Eusebio and Fabio Viviani. On to the season's first Quickfire, vinaigrette, annoying team names, the Stew Room, eliminations and MORE! 1) Intro: Before the 17 new chefs, all ages and expierience, tumble down some steps toward Tom and Padma for their very first Quickfire, we learn a few things about the new contestants: Richard's "inner qeen" wants to know what Padma is wearing more than what the Quickfire will be, Stefan's edgy Finnish accent and Fabio's subtitled Italian one, Patrick's ruddy 'aw shucks' cheeks, Arianne's insecurity, Jeff's vanity, Jamie's tattoos. 2) Quickfire: The chefs have to pare apples (in the Big Apple, see). The first to complete the task to Colicchio's liking has immunity in the elimination challenge; the first nine to finish have immunity from the second round of appledom. Finnish Stefan is the first to finish (obvs, according to him); Fabio also gets through the first round; Alex has to go on to the brunoise part of the competition. We also have our first sight of blood: Richard slices his thumb. After four more complete the dicing round, the last four chefs have to cook something with the newly diced apples on the spot. It boils down to two people up for immediate elimination---first time ever for Top Chef!---and it just happens to be Culinary Institute of Arts BFFs, Patrick and Lauren. Alas, Lauren is history. 3) Getting to Know You: Anxiously trying to make themselves stand out for the cameras, Team Rainbow is formed---21-year-old Patrick, tatooed SF chef Jamie, and big bear with the inner queen, Richard. 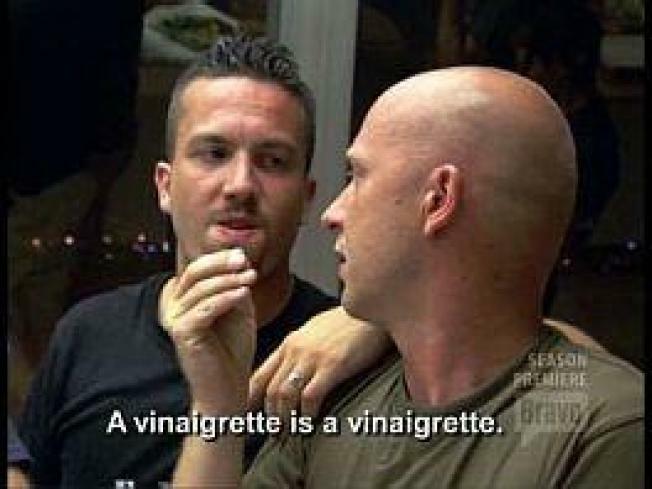 On the flip side, the two LA-based Europeans with the funny accents (who, apparently need subtitles for the general American viewing public) aren't making friends fast with their love of soccer and insistence that vinaigrette is not an emulsion. If they weren't representing LA, we don't think we'd like them much either. 4) Elimination Challenge: The 16 chefs pick knives with different NY neighborhoods on them, and instead of working as a team, they have to go head-to-head cooking a dish inspired by their neighborhoods. Alex and Eugene (Hawaiian in Las Vegas) do Indian; Stefan and insecure Ariane do Middle Eastern food; Fabio and pretty-boy Jeff do Latin cuisine. Additionally, we learn that Carla the Caterer can only "be led by her spirit gods," and that Italian cuisine is too "ethnic" for Colorado's Melissa. 5) Judges Table: Head-to-head, Stefan beats Ariane, Eugene beats Alex, Jeff, even without finishing, beats Fabio. After deliberating with the Big C, Gail and JG, Padma retrieves five cheftestants to stand at the judges' table--three winners (Eugene, Leah, Stefan) and the bottom two (Patrick and Ariane). Padma reminds everyone that in three out of four seasons, the person who won the first elimination round won the entire season of Top Chef, and so...Jean-Georges is most impressed with Stefan's technique and style, so he's the winner. He wants to be the first European to win Top Chef, even if he's just a European living in Santa Monica. Between Patrick, the kid who has talent but no experience, and Ariane, the mom who has 20 years of experience and should know better, Patrick packs his knives, joining his CIA alum friend who "lost to apples." 6) What's in store this season: Martha Stewart, Rocco, tears, more Fabio subtitles, running around, and Stefan calls Jamie a douchebag. It's so on! !